Cinch down the tops of these tall rubber boots and you'll stay dry in the worst squalls and pounding waves. 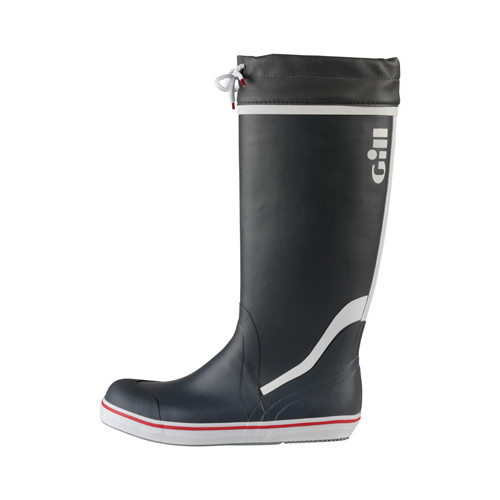 Gill's Tall Yachting Boots are up to the task for your coastal and inshore sailing. Taking the place of your running shoes, not so much. Unless you normally run through creeks and flooded streets. Then you're likely going to be wishing you were on the water, rather than in the water. Just slip these tall boots on and forget about wet feet since they're made of naturally waterproof rubber. You won't be slipping on your wet, heeling deck with their razor cut soles, and they're also non-marking so ugly black streaks won't make their appearance on the white gelcoat. Gill has added a quick-drying polyester lining so your feet will stay dry as the action heats up. They've also reinforced the heels, insteps and toes for extra durability in these high stress areas. You'll find the ultralight cushioned inner soles have exceptional arch supports so your day on deck will feel like a walk in the park. The padded tie tops add a further level of protection against water intrusion from above. Imported.